Additional Information: One of four different team sets distributed by Arco Oil as a gas station giveaway. The Phillies set is one photo larger than the other three Arco sets. The players are capless in nearly all the photos, and each photo contains a facsimile signature of the player shown. The photos are unnumbered, and both SCD and Beckett list the players alphabetically by last name and assign numbers accordingly. Beckett lists the set as “1971 Phillies Arco Oil.” The set name used in SCD’s 2011 Standard Catalog of Baseball Cards is used here. Once again, I find myself delaying a planned post to tackle something else that has come to my attention. This morning at The Hardball Times, Chris Jaffe has taken the time to commemorate the 40th anniversary of what might possibly be, in his words, “the greatest one-game performance one player ever had.” He is referring to the night that Rick Wise no-hit the defending World Champion Cincinnati Reds, and in th e process hit a couple of home runs. 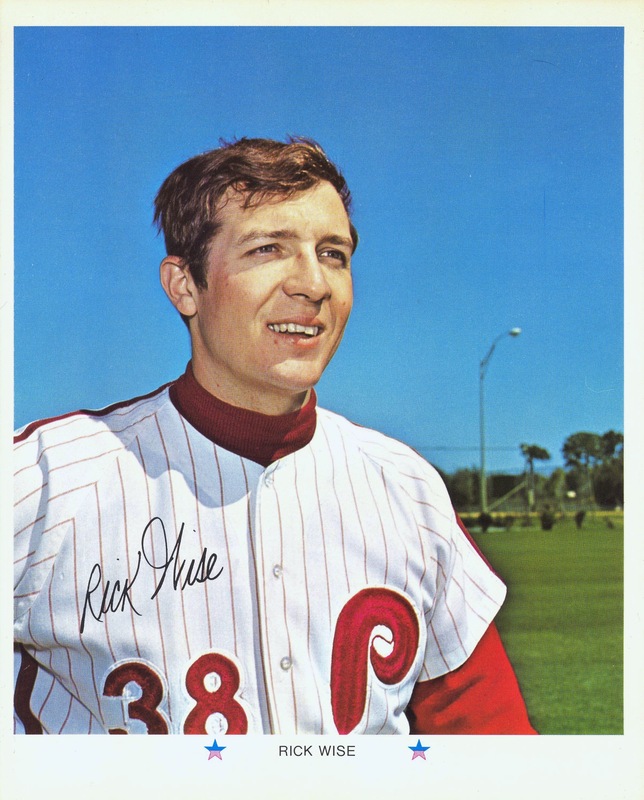 It happened the year before I was born, but in retrospect, it strikes me that particular game, as well as Wise’s career with the club, isn’t properly appreciated by Phillies fans. I’m sure that when the trade happened many Phillies fans decried sending him to the Cardinals for Steve Carlton — Wise was easily the staff ace, as well as (according to WAR), the 6th best hitter on the team. However, the transaction worked out so amazingly well for The Fightins that people seem to have forgotten that at the time, there was legitimate reason to believe he was on the precipice of becoming a Major League ace. Unfortunately, he never took the next step, and Wise’s 1971 season ultimately marked the zenith of what was a respectably fruitful, long career as starting pitcher. A while back, fearful that Topps might not get around to issuing a certified autograph card of him before passing away, I picked up the PSA/DNA certified autograph above. Given his first card came out in 1964 and the Heritage series commemorating that set is now just a couple years away, there’s hope it may happen yet. However, as with all things Topps, I’m not holding my breath. 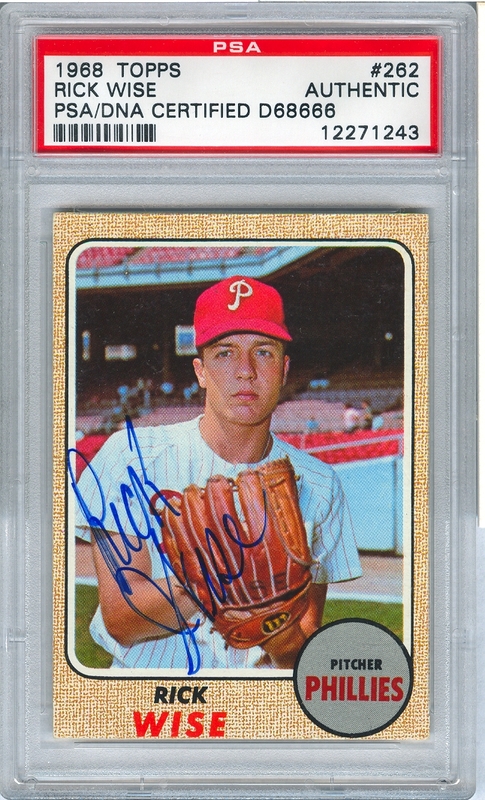 There’s still no Tony Taylor, Clay Dalrymple or Ruben Amaro, Sr. autograph issues at this time, despite multiple opportunities for Topps to do so via the last few Heritage issues. You’d think with the surge in Phillies fans and collectors over the past few years that Topps would be paying attention. Sadly, they’re not — although there were a couple planned autographs for this year’s release, they didn’t materialize. Next year, they’ll be joined by Art Mahaffey and Cookie Rojas as notable Phils deserving of the honor. It will be interesting to see who Topps actually decides to call on. 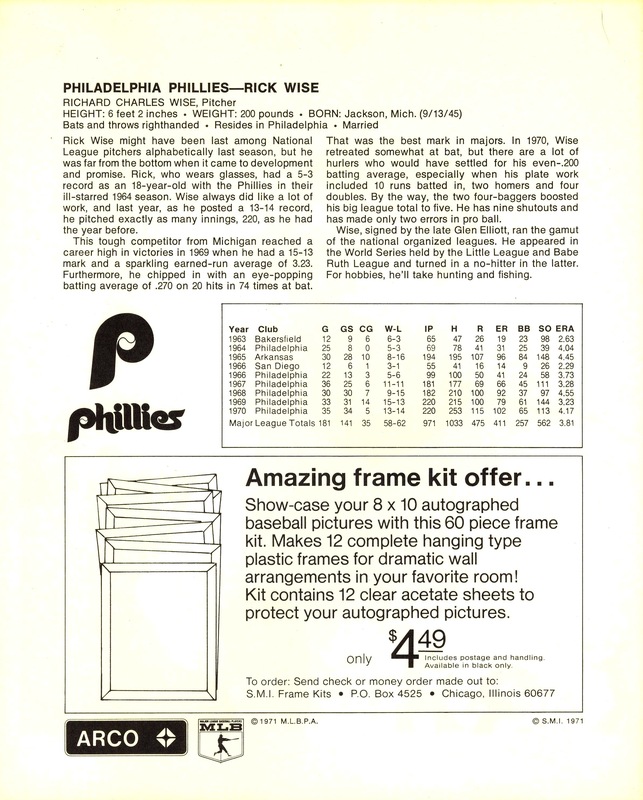 Until then, here’s to Rick Wise, possibly one of the most under-appreciated players in Phillies ever and arguably the man responsible for the greatest one-game performance in MLB history.